This stunning island, a 40 minute ferry ride from Downtown Auckland, boasts 92sq.kms of beautiful beaches, vineyards, olive groves, native bush and laid back seaside villages. There is also a range of activities that can be experienced such as vineyard tours, major festivals, segway tours, zipline adventures, bush walks, charter fishing, sea kayaking, and bicycle and scooter hire. It’s a great day out from Auckland for a weekend getaway, or longer to attend, a wedding, special event, conference or as a superb longer holiday destination spot. The best vantage point to see Auckland is from the top deck of a boat in the Hauraki Gulf, and one of the best ways to experience it is on board a Waiheke Island ferry. There are three ferry companies offering daily services to Waiheke Island. Fullers Ferries has up to 20 departures every weekday with a few less on weekends – check online for special ‘$10 hot seat deals’. Combine your ferry travel to Waiheke with a 90-minute scenic tour of the island, plus unlimited bus travel for the rest of the day. It’s a great way to make the most of a day trip to Waiheke, offering you flexible and cost effective transport, while introducing you to the island’s best sights. Explore Waiheke offers 17 daily ferry departures Mon-Fri, 13 sailings on Saturday and 12 sailings on Sunday. Sealink Car & Passenger Ferry offers 13 daily car and passenger ferry services from Half Moon Bay, allowing you to pack the car and unpack at your accommodation. Sealink also offer daily car ferry sailings from Wynyard Quarter in the city. Check in online for ‘Super Saver’ departures, which can save $88 off a regular return fare. All the ferry companies have licensed onboard cafes. No matter how long you stay on the island you’ll need transport once you disembark from your ferry. My advice is if you just want to nosey around a few vineyards then book The Vineyard Hopper which is for people who like to plan their own adventure at their own pace. It’s a unique and cost effective hop-on, hop-off bus service, where you can visit some or all of the participating vineyards and stay for as long or as little as you like, without having to worry about driving. Waiheke Island is home to 30 vineyards, many boasting award winning wines. The Hopper’s timetable has been carefully designed so that you can visit eight key locations through six convenient stops. If you prefer to join a tour then most companies will meet and greet you as you step off the ferry. Companies such as Waiheke Island Wine Tours are a small, and highly personal, Qualmark accredited tour operator, who accommodate no more than nine people per vehicle. The company includes all the island’s top vineyards including Te Motu, Obsidian, Jurassic Ridge, Kennedy Point, Peacock Sky, Cable Bay and Mudbrick. Included in the tour is travel between vineyards, tasting fees of at least 14 seriously good wines, chilled bottled water and Waiheke Island of Wine Guides, plenty of time for a leisurely lunch, and return transfers to the ferry (or your accommodation). For private tours, Man O’ War Bay and Passage Rock vineyards can also be arranged with the option of lunch at Poderi Crisci. Not included are ferry fares, lunch or wines taken with lunch. Besides all the regular buses that meet every ferry there are numerous transport options for the visitor stepping on to Waiheke Island. If you want to go it alone then the best thing to do is hire a car, people mover or the ever-popular scooter from Rent Me Waiheke at Matiatia Wharf. If you prefer pedalling yourself around the island, Waiheke Bike Hire is in the car park by the ferry terminal and in a matter of minutes you can be on your way. Another option, depending on your requirements, is to talk to Island Shuttles, as they can arrange group shuttle transfers for your personal, corporate or social group anywhere on Waiheke, including sightseeing and vineyard tours, as well as personalised transfers in a range of vehicles from 25-seat coaches to 12 and nine-seat mini coach transport. Their bus and van combinations allow you to transfer any number of passengers to any location, year round. If you are part of a small group consider jumping in a taxi to the vineyard of your choice and the cost can then be shared equally. Another travel option to see more of Waiheke Island is to take a Horse Tour. Waiheke Horse Tours operate on the eastern end of the island where besides tours you can take lessons, have a horse trek picnic, or you can even take a horse trek from between 3-5 hours to one of two local vineyards for lunch. I don’t think many people leave Waiheke Island without having a meal or light lunch at one of the island’s famous world-class, award-winning vineyard restaurants. The best known ones that spring to mind offering full restaurant-style facilities include, Mudbrick, Cable Bay, Stonyridge, Casita Miro, Poderi Crisci, Te Whau, Te Motu, Goldie Wines, Miro, Passage Rock and Peacock Sky. But if all you need is a light snack then there are five other vineyards that offer a limited menu that will at least tempt you to enjoy their wine tastings, and these include, Wild on Waiheke with a= menu of platters, pizza and burgers which also go well with their on-site brewed Barona beer, Man ‘O War Vineyard also offer platters, Kennedy Point Vineyard serve delicious local oysters, Kiwi cheeses and smoked salmon or visit Frenchman’s Hill Estate to sample their superb wines accompanied by a delicious homemade “Plat Du Jour”. At The Batch Winery you can relax and soak up the views with vintage dishes, such as high tea and Bubbles or bacon and egg picnic pie followed by seasonal fruit and Anzac crumble in winter or in summer, smashed raspberry pavlova. The Batch also offer a courtesy shuttle bus to/from the Explore Ferry every hour. Visiting Waiheke shouldn’t be all about land-based adventures. One of the best ways to see Waiheke is either on a guided kayak tour or by renting a single or double kayak to venture around the bays nearest to the Matiatia ferry terminal. Ross Kayak Rentals have a variety of single and double kayaks, both lightweight kevlar and plastic kayaks, as well as day boats and expedition doubles. These can be hired for a minimum of two people for safety reasons. They are available to those with sea kayaking experience only. Hire rates are dependent on your trip plan. 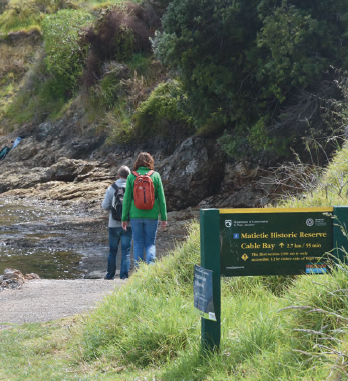 Their guided trips are recommended for first time paddlers and all those people who value the additional insight of an experienced guide to explore Waiheke’s coastline. There are a number of fishing charter boats on Waiheke where the snapper are plentiful. Whether you are a keen fisherman, or a novice, young or old, experience the fun and excitement of fishing on Waiheke in a Fyran 580, with Phil Scott, your skipper of Adventure Fishing Charters. His Waiheke fishing trips leave from Matiatia Bay and last approximately four hours in either early morning or afternoon. Another relatively new operator is FQ Fishing Charters who offer half day, full day or overnight options with destinations including Waiheke Island, Great Barrier Island, Little Barrier, Mokahinau Islands, Cuvier Island and Coromandel in their 10.2 metre SSM surveyed vessel, custom built and fitted out to the highest specifications to make your fishing charter adventure and discovery cruise comfortable and unforgettable. 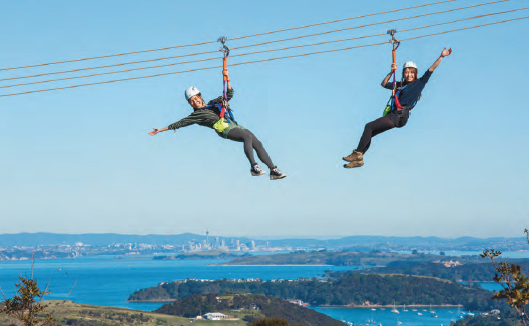 Eco Zip Adventures offers state-ofthe-art flying fox ziplines and an eco-immersive forest walk on breathtaking Waiheke Island, for nature lovers of all ages. You’ll enjoy the full Waiheke experience with a complimentary pick up from an island ferry and returning you to your pick-up point or one of the many vineyards, restaurants, beaches or villages. Booking this adventure will include a Waiheke highlights tour, featuring many of the island’s golden beaches, its charming olive groves, world-class vineyards and multi-million dollar properties. The experience offers three unique ziplines, each 200 m long, with dual cables allowing you to fly side-by-side with a friend, making this an exceptional, shared experience. Afterwards enjoy an easy, 1.4 km guided nature walk, exploring pristine, pre-European native forest. Another island experience that is relatively new is SegWai Journeys who have devised two special tours: View to a View and Bay to Beach that are personalised tours on Segway vehicles, quietly gliding you and your group through native bushland, wetlands, vineyards and beach environments to really experience parts of Waiheke Island that only the locals know about. They can also arrange corporate team building tours for any special event your company may be planning. Pack up the family and a picnic and take a day off to visit Waiheke Island’s most beautiful beaches. The best-known ones for swimming include Oneroa Beach (below the island’s main village and close to the ferry terminal) and Little Oneroa Beach, Palm Beach, and the small, little-known Sandy Bay and Enclosure Bay as well as the always popular Onetangi Beach, where the two best beach bars, 4th Street Bar and Grill and Charley Farleys are located. 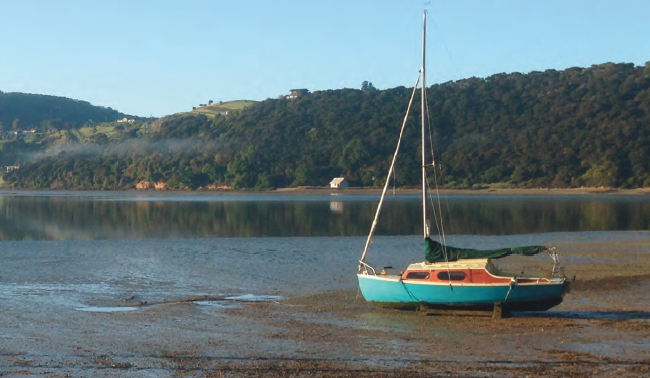 If you enjoy camping head to the island’s only campground at Whakanewha Regional Park where there is the beautiful seldom trodden Whakanewha Bay shingle beach waiting to be explored along with some lovely walking tracks nearby. The island’s main village, Oneroa, is delightful and full of character and home to a variety of restaurants such as Vino Vino, Caf. Fenice, Delight Turkish Caf., Ajadz Indian Restaurant, Oneroa Beach Club, Wai Kitchen and Little Wai, Solar Eating House, The Red Crab Thai Restaurant, The Local (fish & chips and burgers), Cove Bites & Brews, Sandbar which stays open very late, and the renowned Oyster Inn. There are also a number of shops retailing food, wine, arts, crafts, and clothing as well as Waiheke Kiwiana such as Shop on the Rocks, Tivoli Booksellers, Take Note, Toi Gallery, Victorian Gilt, Glowing Sky Clothing, Body & Soles, Waiheke Flower Shop, Salt Clothing & Jewelry, 1st Stop Liquor, Waiheke Wine Centre, Chances Surf NZ, Christine the Artist Goldsmith, Walking Life, The Veranda, Island Designs, E-Cycle Hire, Oneroa Chemist, Waiheke Fruit and Veg, and the Oneroa Four Square. Waiheke’s coastline boasts many beautiful walks with stunning views over splendid beaches, farmland, native bush, picturesque vineyards, charming villages, local reserves and across to the surrounding islands and the Coromandel. Discover and explore historic sites and many unseen viewpoints along the many scenic walkways. There are eight well-signposted walkways, two of which start right at the ferry terminal – just follow the coast left or right as you leave the wharf and keep to the yellow and green signposts. Take plenty of water, a hat, sun screen and sturdy walking shoes (some of the hiking trails are quite rugged). One of the mainstays of Waiheke Island is the number of festivals that are organised each year, some appealing to all walks of life and others that are more specific. The bi-annual headland “Sculpture on the Gulf” attracts tens of thousands of visitors and rightly holds the top spot. Other well-known events include (in March): the Waiheke Island of Wine Vintage Festival, and Jazz & Blues in the Vines, (April): the Waiheke International Jazz Festival, (May/June): the Waiheke Winter Arts Festival, (October): Waiheke Book Festival, (November): The Waiheke Walking Festival, the Waiheke Island Garden Safari, and the bi-annual Waiheke Olive Festival…to be held next in November 2016. If you are looking to organise a special event or need a unique conference or function arranging on Waiheke Island then the best organisers to talk with are Destination Waiheke Island. Rob and Karen Webb have over four decades of combined international hospitality experience and a passionate connection with the island they call ‘home’. Destination Waiheke Island are the perfect team to organise your next conference, meeting package, function, food and wine experience or team activity including transport and accommodation. If you have a group of between 10 – 250, then let them take the hassle out of putting it all together for you, with perfectly matched people in the required field of expertise. 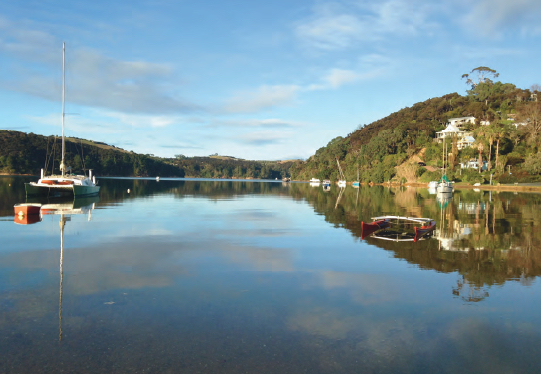 One of the lovely aspects of Waiheke Island is the large range of accommodation options that are readily available. Whether visiting Waiheke for a romantic break or a long weekend vineyard tour you’ll soon realise you are a world away from Auckland. Choose from quaint B&B accommodations, bach-style cottages, holiday homes, and Mediterranean-style self-catering apartments or indulge by lapping up luxury in one of the island’s premier resorts. The largest accommodation provider on the island is Waiheke Island Resort in Palm Beach, which has only recently reopened after a complete refurbishment. Another large accommodation is The Lodge, which offers luxury, self-contained, accommodation for 20 to 26 guests for family reunions, wedding parties, corporate retreats or a big chill with family and friends. Commanding spectacular views from its ridgetop location, The Lodge provides a unique blend of privacy and tranquillity. Hosted resorts are also very popular with newcomers such as Marin Ridge, or an award-winning boutique lodge such as The Pah, capturing all day sun and spectacular sea views, this architecturally designed accommodation with a nod to Balinese living is spacious yet inviting, you get the feeling that you are hovering above the dazzling Hauraki Gulf. The Beach Villa Duplex is a premium holiday home located in front of Oneroa Beach. This large, modern architecturally designed home can accommodate up to 16 guests in its seven bedrooms, and five bathrooms. It can also be used as two separate fully self-contained homes. No matter what time of year you visit Waiheke Island, the major jewel in Auckland’s crown, you’ll find, a plethora of friendly locals greeting you, superb white sandy beaches, lovely seaside villages, fun pubs and bars, great shops and galleries, adventurous outdoor activities, fantastic accommodation, award-winning restaurants and some of Auckland’s finest vineyards just waiting for you to knock on their cellar door. The secret is out – Waiheke Island has been named one of the world’s Top 10 regions for next year in Lonely Planet’s Best in Travel 2016 publication. The travel bible has dubbed the island the “playground of the gods” and ranked it number five in the “Top 10 Regions 2016” list, alongside Transylvania, West Iceland, Valle de Viňales and Friuli’s wine regions in Italy. This is the 11th edition of the book, which covers the best trends, destinations, journeys and experiences for the upcoming year. Auckland Tourism, Events and Economic Development Chief Executive, Brett O’Riley, says this sort of recognition added weight to the city’s marketing efforts to attract domestic and international visitors. 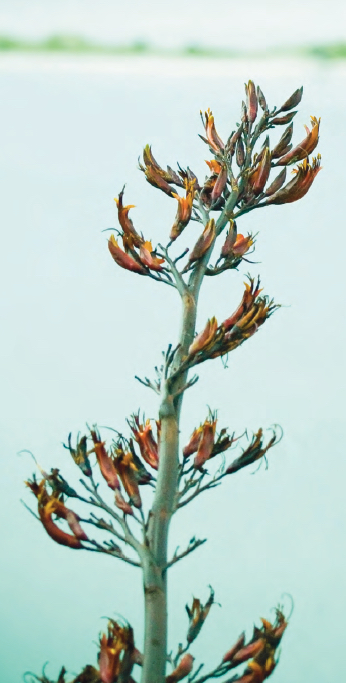 “More visitors to the region creates more jobs, more money for the economy and helps support the development of better infrastructure to accelerate the transformation of Auckland to the world’s most liveable city.” The Top 10 Regions 2016 were independently nominated by the authors, staff and travel community of Lonely Planet. The chapter on Waiheke Island was written by Lonely Planet’s Chris Zeiher who has long been a fan of the region as a whole but made special mention of Ecozip Adventures, Mudbrick, Cable Bay, Oyster Inn, Wild On Waiheke and Fullers Vineyard Hopper.